Raytheon has been selected to supply active electronically scanned array (AESA) radars for the U.S. Marine Corps’ F/A-18C/D “classic” Hornet fleet, the company announced on January 15. The APG-79(v)4 radar will be delivered from 2020 with deliveries completing in 2022. The APG-79(v)4 shares around 90 percent commonality with the APG-79 that is installed in the F/A-18E/F Super Hornets and EA-19G Growlers of the U.S. Navy and Royal Australian Air Force. The radar has been scaled to adapt it to the classic Hornet. 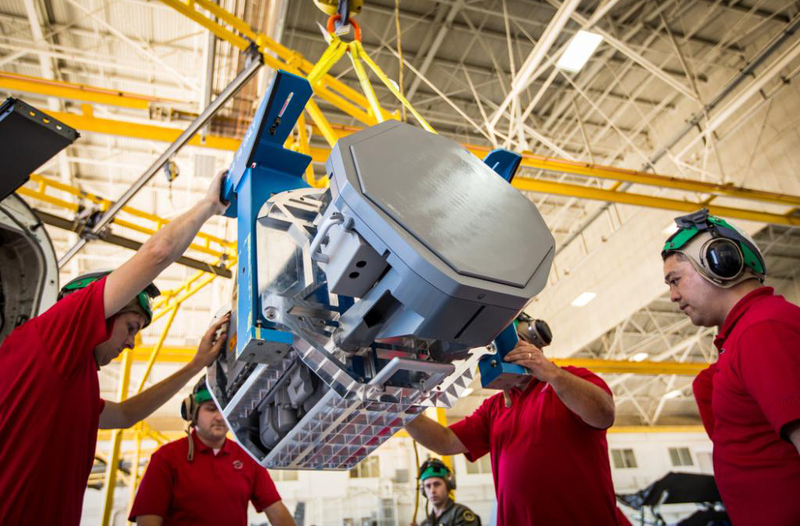 "With AESA radars, fighter jet pilots and crews tip the scales in their favor over their adversaries," said Eric Ditmars, vice president of Raytheon Secure Sensor Solutions. "Now that the APG-79(v)4 is slated to fly on the classic Hornet, Marine Corps pilots will be able to identify, track, and engage more targets over a greater distance than ever before." AESA technology not only offers significant improvements in combat capability, but also greater reliability due to the reduction in the number of moving parts, and also the ability to allow the multiple transmit/receive modules (TRM) of the radar array to fail individually without noticeably affecting the performance of the overall system. This “graceful degradation” requires no maintenance input until the point is reached when sufficient TRMs have failed to adversely affect radar performance. Maintenance requirements for the APG-79(v)4 will be reduced compared with those for the current APG-73 mechanically scanned antenna, and further cost-savings will arise due to the commonality with the APG-79 and the ability to draw on the Navy's logistics and supply chain for that radar, as well as benefitting from a common development path. Under current plans, the Marine Corps anticipates equipping all of its fast-jet fleet with the Lockheed Martin F-35, with plans to acquire 353 F-35B STOVL aircraft and 67 carrier-capable F-35Cs. The latter will maintain the Marine Corps’ commitment to providing aircraft to U.S. Navy carrier air wings, a tasking currently assigned to the F/A-18C squadrons. With the plan to replace the AV-8B Harrier II with the F-35 in the first place, the “classic” Hornet is required to serve for some years yet. According to the request for information that was issued last spring, the requirement covers 98 AESA radars. Currently, the Marine Corps operates eight F/A-18C/D squadrons split between bases at Beaufort, South Carolina, and Miramar, California, and it is expected that seven of them will each operate 12 AESA-equipped aircraft, the remainder of the radars being held as spares. The fleet includes 30 F/A-18C+ aircraft that were restored to service with increased airframe hours. First-generation F/A-18A+/B+ Hornets also remain in service with two reserve units and a training squadron. These aircraft will not receive any further upgrades.